Yesterday, Blogger has announced another Blogger Birthday feature. 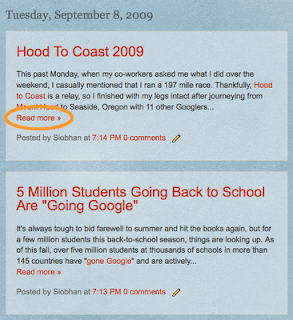 Blogger has add readmore feature on your post. Now you dont need to add any code because this new readmore feature ease us to choose whether show full post or break post. If you don't use the new post editor, you can still insert a jump break in Edit HTML mode by adding <!-- more --> where you want to break your post. @digu: on your page element. Hmmmm...glad to know that, thanks for share. thanks for sharing these nice tips..
i added u as my friend in gmail contacts list. ko d blog syaha g mmuncul fasilitas jump break nya yah??? Thanks a lot for saying about useful review. It is required to understand that android apps development could help in your industry by installing customized software products. It's well done posts. Let me mention about home insurance rates for USA policy owners home insurance agents. Compare online free quotes on homeowners insurance. Thanks for sharing with us this great posts. You have nice chance to choose casino affiliate programs. The most common casino programs such as paf affiliates and great poker rooms such as redbet poker affiliates. Oakley Sunglass Sale Any four-post a long while silent, it is conceivable frown, later said: "stones, you can stay aloft?" oakley radar pitch sunglasses Area girl said: "Mackie stones you get back to it, really good today, long day, everyone is tired, early closing." oakley sunglasses for sale The next morning the alarm rang, Li Rong rubbing his face, "Wow, the stones, you will afford a cast-iron." www.verycheapoakleysunglasses.com Children obedient like a small duck with her upstairs.